A hammer is one of the oldest tools known to man. It is used in different construction tasks, redecoration, and DIY projects. Even with the presence of more power and pneumatic nailing tools, the framing hammer remains one of the essential tools used in crafts and construction. Finding the best framing hammer is important for anyone who is interested in doing something unique for his or her home or business. It does not matter whether you are an amateur or an expert, you will still need a framing hammer to have the job done. You will not see a construction worker or even kid building a birdhouse that doesn’t need a hammer. Although the hammer was invented thousands of years ago, when man decided to build homes for shelter rather than sleeping in caves, it is still in use all over the world as long as people use wood in construction. There are still a few modern features that have been added to hammers to make life easier for those who use it. In this article, we discuss the most important things to look out for when getting a framing hammer and how to choose the best framing hammer on the market. Which Job Are you Using The Hammer For? There are different types and models of hammers available, and each one of them is perfect for a certain job. You need to be aware of the kind of job you want the hammer for to choose the best design. If you are mainly interested in regular carpentry work, you might be interested in a curve claw or a rip claw hammer. Both are good for driving nails, but the curve claw has better leverage which makes it a lot easier to remove nails. The rip claw is perfectly designed for ripping out boards. 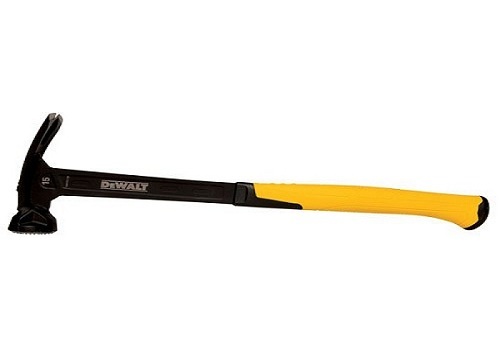 A framing hammer is best used for heavy carpentry work as the long handle makes it easier to drive and remove bigger nails that are suitable for heavy work. It is also heavier in general than rip claw and curves-claw hammers to better drive big nails into different surfaces. Everyone might have their personal preference when it comes to hammers, but choosing the hammer that best suits your job will ensure that you finish it faster and with higher quality. What is your Hammer Made Of? A heavy hammer is not necessarily a powerful one. Some hammers are made of titanium which is very light yet very sturdy. It might provide a greater steel striking power for its weight.However, a problem with titanium and it tends to chip with repeated work and might cause sparks. This is why some people prefer to use steel. Steel won’t chip or break and will probably last for years before you even consider replacing your hammer or its head. But working for hours using a heavy tool can cause muscle strain. You must choose a hammer that you are comfortable to carry for a long time. When you are on a DIY project or taking up a task of redecorating your house, you usually end up holding a hammer for most of the day. It is crucial to choose a hammer that is not too heavy for you to carry so that you can control it well. When you are not comfortable with the weight of the hammer, you might not be able to carry it in the right angle or the right position to drive the nail properly. If the hammer is too light, however, it might not have the appropriate force to drive nails into different surfaces which will jeopardize your job. Choosing the best hammer that you can control and manoeuvre with ease is very important to finish your job perfectly and without any injuries. A hammer is a tool used to amplify energy and converts kinetic energy from the swing to the hammer head, which in turn drives nails into different surfaces. That is why the driving force of the hammer will depend on the head weight and design. Lightweight heads will provide higher velocity with each swing. The strength of driving is also determined by the materials used in the hammer handle. Using vibration absorbing materials will provide more velocity and hence more driving power. The actual striking power is a combination of many other factors, so it is important to take this into consideration when you are getting a framing hammer. You need to choose a hammer that won’t slide off your hand when you are working for hours. You need a hammer with a safe grip so that you can hold easily to whether you are wearing gloves, or your hands are sweaty. You need to choose a hammer that is perfectly designed for the kind of nails you are more likely to use. The design of the hammer will determine the swing efficiency and accordingly the striking power of the hammer. There are hundreds of models available on the market, with different materials, price ranges, and quality. The most expensive framing hammer is not necessarily the most expensive one. You need to value the price versus the quality of materials. High-quality hammers will not break and will put up with different tasks. You must choose a high-quality hammer that will put up with different tasks and will be efficient for different nailing tasks and projects. 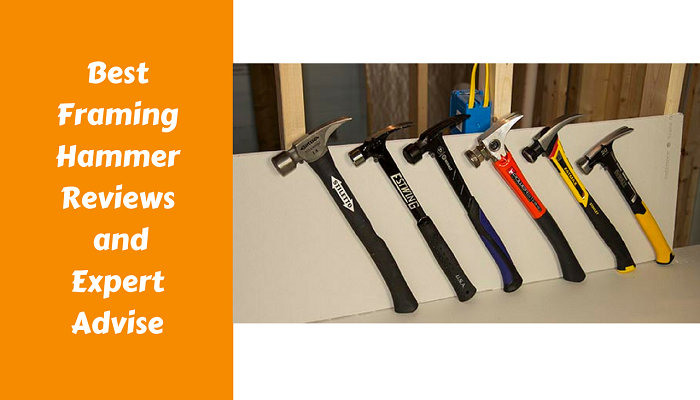 In this article, we review some of the best framing hammers available on the market and the most important features that distinguish each one of them. One of the best titanium hammers available on the market. It is lightweight at 14 ounces only, but it has a great striking power. It is easier to handle and carry than the usual 16-ounce hammers. The handle is specially designed to emphasize the swinging power, and it won’t slip easily. It provides great striking power for its weight and has less shock than steel hammers thanks to the unique design that absorbs vibration. The titanium is the very light weight which makes this hammer easy to use and handle for long hours making it the best for anyone who is interested in DIY projects. The nail groove will protect your fingernails against accidental hitting. The nose of the hammer features a nail start that is optimum for one-handed nail setting. This is almost half the size of conventional hammers but is no way of less striking power. Titanium is a sturdy metal that will drive nails with great power that resembles almost 24 ounces of steel at a very lightweight which is only 14 ounces. This makes this framing hammer one of the lightest hammers on the market. It comes from a reputable company that has been manufacturing hammers since forever. The company still implements the newest technologies to provide the best products on the market. 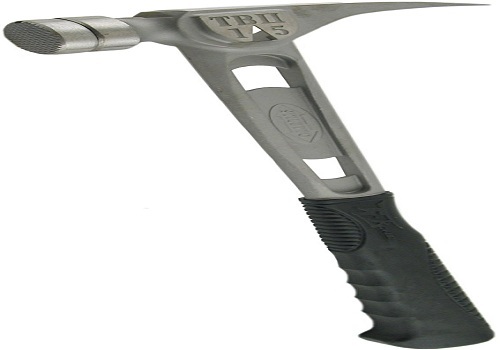 This titanium hammer provides less shock and vibration than other conventional steel hammers. The titanium is so lightweight that you will not be facing fatigue and muscle injuries associated with using the hammer for long hours. It features a curved handle, which provides greater swing power necessary for efficient functioning. It features a nose that is perfectly designed for one-handed nail setting. The sleek design is suitable for all decorating and DIY projects with maximum comfort and safety measures. Titanium is known to spark when chipped but with this specially designed framing hammer, there is no such risk. This hammer is rim-tempered to prevent sparking that might happen due to chipping of titanium. The head is designed for various driving situations and different surfaces and is specially treated for maximum durability. The face features a chickened design which provides more nail grip making it one of the best models available on the market. The magnetic nail starter is essential to handle one-handed nail setting with ease and comfort. The handle is designed in a way that is meant to provide the greatest striking power per swing, and it will not slip easily no matter what. The head design gives greater balance and a greater striking surface. The hammer features a double-wedge head-to-handle assembly for a secure fit that enables you to finish your DIY projects in no time. This hammer features a professional quality at an affordable price with an easy to handle design and weight. The hammer comes with a limited lifetime warranty for many years of hard work and amazing projects done. A steel product that comes from a reputable company. This hammer is made of steel for maximum durability and sturdiness. It will suit all DIY and construction projects that you might want to take over. It only weighs 15 oz. which makes it super easy to carry. It will not break or bend under any working conditions, and it will do the job perfectly. The magnetic head starter is specially designed for one-handed nail setting, and this will make your job easier. The handle is specially designed to absorb shock and vibration, making this hammer so much easier to handle and work with. The nail features a checkered face design for better nail grip that comes with a high-quality product. The hammer comes with a limited lifetime warranty and will probably last for decades of hard work and efficient use. There will be no fatigue or muscle strain, and you will be able to handle your hammer perfectly to finish your construction tasks in the best quality possible. A simple design that is by no means fragile. This framing hammer cuts the hassle and talks business. It is made of one piece of forged steel for maximum durability and long lifetime. It won’t break or chip under different working conditions. The hammer is fully polished and features a straight claw for different tasks in DIY projects and construction or decoration tasks. This simple and hassle free design is preferred by amateur and expert craftsmen as it is easy to carry and will ensure that you have the maximum driving power. The handle is made of nylon-vinyl so that you can hold it for hours with ease. Unlike metal, it will not be affected by heat or cold, and it won’t slip whether you are using your bare sweaty hands or wearing gloves. The hammer weighs 22 oz. Therefore, you can hold it for hours without facing muscle strain or fatigue. The lightweight and simple design will enable you to use it in different angles and nailing situations. There is no need for sophisticated tools when a simple, reliable one can do the job perfectly. A sturdy framing hammer does not have to be extra heavy. Very heavy hammers are not easy to control and might slip and cause different accidents. They are also not super easy to work with, especially that a hammer is a tool that you probably use for long hours. With that in mind, this hammer is designed to provide the maximum swing power and driving power for its weight and design. This framing hammer is made of one piece of forged black steel. There are no bits and pieces making this hamster very durable and sturdy. It will not break and will be strong enough to drive nails into any surface and under any circumstances. The sleek design is easy to man oeuvre and will be used in the toughest angles with ease. 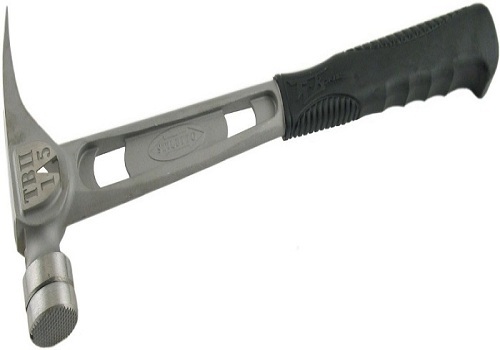 The handle is made of nylon vinyl, which makes this hammer super easy to carry for hours. The vinyl is easy to hold onto, and the grip won’t slip after hours of hard labor. 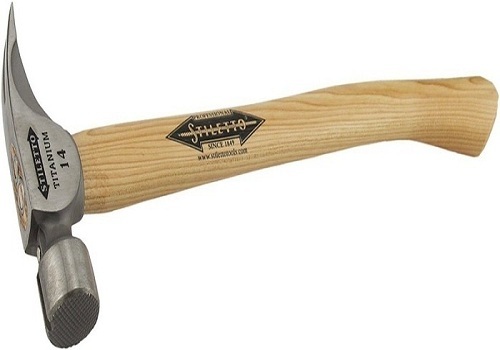 This hammer is designed in a professional way to be used by craftsmen and tradesmen with ease and comfort. The face is designed to maximize the driving power to drive nails with ease to give your working surface a polished and professional finish. The handle also is designed to reduce vibration and shock which will also increase the driving power of this hammer compared to the other models available on the market. Another sturdy, lightweight titanium hammer. This framing hammer comes with replaceable faces to replace with ease if the hammer is worn out. You can use either the smooth or the milled face to better suit your needs and preferences. This framing hammer is only 15 oz. but provides a 24-ounce steel power making it very durable and sturdy. 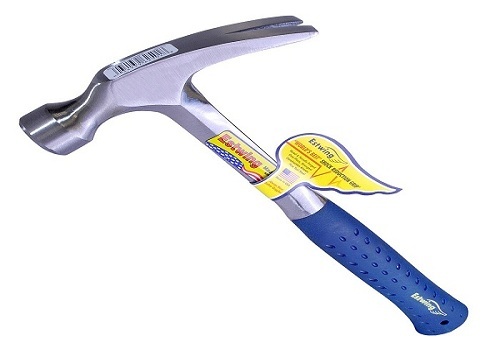 It is stronger and lighter than other steel hammers with less shock, which is essential for efficiency and comfort. This lightweight will be held for hours without fatigue, and the shock absorption feature will ensure that it drives nails efficiency at no time. The hammer features a magnetic start to better suit one-handed nail setting for maximum comfort during work. The handle is made of rubber that will not be affected by heat or cold. It is also easy to hold onto and will not slip if your hands are sweaty.You should be able to wear gloves or have wet hands and still can hold this hammer perfectly. Holding and working with this hammer is super easy and safe thanks to its sleek and innovative design. The high-quality materials will ensure that this hammer will last for years for hard work and hundreds of projects. 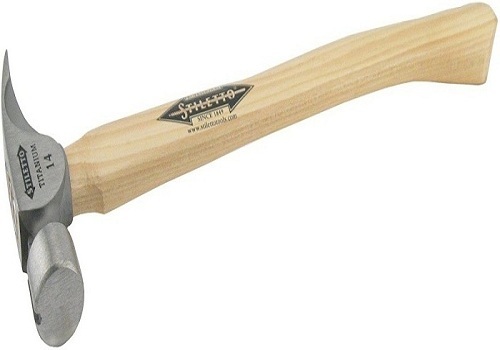 This is a great framing hammer with amazing features. 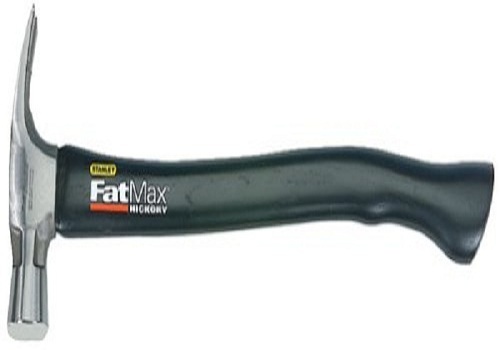 This hammer features a head that is 75% larger than other framing hammers for maximum nail driving accuracy and power. It is designed with anti-shock and vibration absorption features for better control and stronger striking power. The hammer has special stabilizers to reduce arm-twisting and muscle fatigue that is more likely to happen when you use a framing hammer for long hours. This hammer has a head that offers better balance in addition to maximum control for one-handed setting of nails thanks to its magnetic nail starter. The hammer features tempered rim and head for maximum durability and protection against chipping or breaking with different projects and tasks. The head features a checkered face for more balance, accuracy, and control while driving different nails through different surfaces. 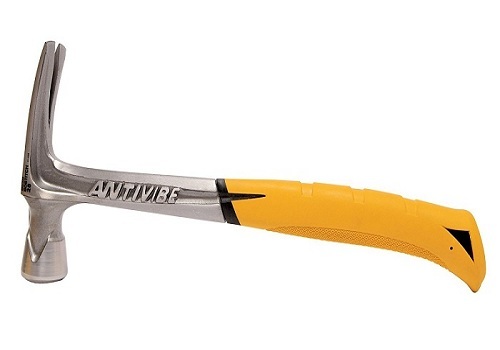 This hammer comes with a specially designed handle that provides maximum grip and control. It is super easy to handle and carry for hours for perfectly finished projects, and it comes with an outstanding 100-year limited warranty as it is expected to be passed down through generations. Titanium is a hard metal that is very lightweight which makes this hammer perfect for different jobs and tasks. It is only 15 ounces with great striking power that is up to 28 ounces of steel. This lightweight and sleek design are perfect for eliminating fatigue and muscle strain. It is easy to handle and carry thanks to its easy to hold onto the grip. You will be able to use this hammer for long hours, and it will provide the maximum control and accuracy. The hammer features a magnetic nose that is essential for one-handed nail setting to make your task super easy. The straight handle is covered in specially designed rubber that will absorb moisture from your sweaty hands. The hammer will not slip or strike your fingers while you are working. The rubber handle is also essential to maximize shock and vibration absorption. This hammer features a 1.5-inch milled face with a total length of 17 inches. The hammer includes a free replacement milled face. 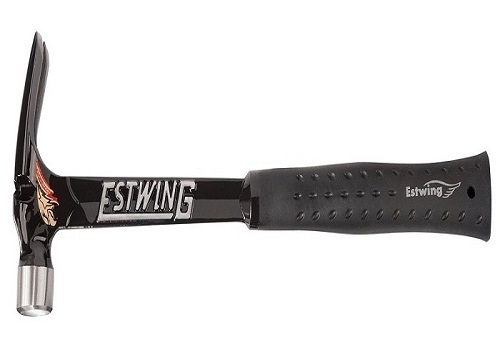 The hammer features a great striking power with the least weight for maximum comfort and control. It comes with a one-year warranty. This hammer is made of sturdy steel that will not break or chip with use, and this is exactly why it comes with an incredible lifetime warranty. It will last for years and will finish different jobs and tasks perfectly. It weighs 22 oz. In addition, features great striking power for its size and design. This high-quality hammer comes with patented torsion handle that will minimize strain on wrists and elbows after hours of hard work. The handle features an Anti vibe technology to minimize shock and vibration, which allows for better accuracy and control. The hammer comes with a magnetic start which is perfect for handling one handed setting of nails, and the check red face allows for maximum accuracy and balance with different nailing tasks. It is forged from one piece of hard steel for maximum durability. Framing hammers are unlikely to go out of business anytime soon. As long as there are tasks and surfaces that need to be nailed, there will always be a demand for hammers. The best hammer must be easy to handle and control. Choose a hammer that is light enough for you to handle with ease and that will not strain your wrists or elbows. Make sure that your hammer will not slip on your fingers or your working surfaces. 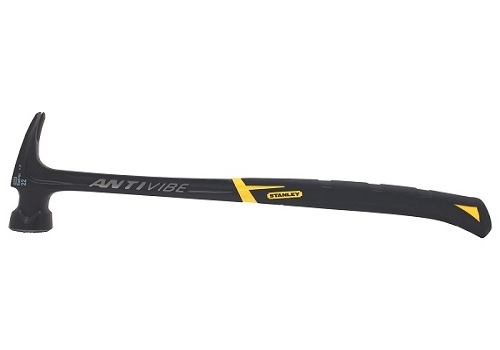 Choose a hammer that has a handle specially designed to maximize wave and shock absorption. Best framing hammer should have features that promote balance and accuracy. There will always be a trade-off between size, weight and power so choose the framing hammer that best suits your needs. Some hammers come with extra faces or replacement so you will probably keep them for life. Choose a hammer that is sturdy and durable that comes with a warranty, as it is most probably going to be used for years. We recommend that you buy a hammer that is perfect to handle and carry to use in different angles and situations. Remember that you should be careful with what you buy, as you will probably be passing it on to your grandchildren.